Home Brazil Will Brazil be late for the party? Will Brazil be late for the party? Unsettling news from Brazil in this week’s papers, where there were reports of serious delays in the preparations for this year’s World Cup, with less than 100 days left until it all kicks off, on 12 June in São Paulo. Half of the 12 stadia weren’t ready by FIFA‘s deadline of 31 December 2013. 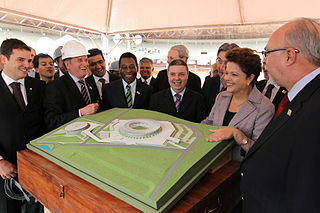 Even now, more than two months later, five have still to be passed as fit for purpose – including that stadium in São Paulo where the opening ceremony’s to be held. Everyone’s favourite football administrator, FIFA President Sepp Blatter, has lambasted the Brazilians for starting their preparations too late, in spite of having had seven years to get ready – longer than any previous hosts. Perhaps surprisingly, given Brazil’s reputation as a nation of football fanatics, the World Cup hasn’t won universal popularity among the general public. There have been several demonstrations against the amount of public money being spent on prestige projects linked to the Cup, instead of on better transport infrastructure and education. A recent opinion poll suggested that Brazilian public support for the event had dropped from 79 per cent in 2008 to a mere 52 per cent now. Will there really be a problem, though? It’s become pretty well standard for the run-up of any major sporting event to be accompanied by mutterings of lack of preparedness, running over budget, security risks, political unpopularity and general maladministration. The 2012 Olympics in London were no exception. And yet they seem to have gone off pretty well, barring the empty seats (which of course is the perennial complaint that arises once the event gets under way). It’ll probably be a case of “all right on the night”. Let’s hope so, anyway. If you’re currently living in Brazil and know different, then please let us know by leaving a comment below – we’d love to hear from you. As for me, I’ll be watching what I can on the telly – which won’t be much, as even the earliest kick-offs will be at around midnight here in East Asia! Want to find out more about the host nation of this year’s World Cup? Have a look at our eBook The Facts Lab Book of Brazil: 101 amazing facts about Brazil and the Brazilians – available on Amazon’s Kindle Store now! This entry was posted	on Sunday 9 March 2014 at 09:26	and is filed under Brazil, Expat Destinations. You can follow any responses to this entry through the RSS 2.0 feed. You can leave a response, or trackback from your own site. I’m not living in Brazil but I am planning to go for the world cup. If there are any expats there who would like to meet up so I can get a better feel for the place more than just football. Please give me a shout. Lucky you! Did you manage to get tickets, or are you just going for the experience? It sounds as if they’re trying to crack down on the ticket touts harder than ever before, but then again, they’re always claiming that! Things are hotting up! Police warn visitors “Don’t scream if robbed”. Get the full story on the Beeb.